This is our best look yet at the updated 2019 Porsche Macan. It’s no secret that Porsche’s best-selling model, the Macan SUV, is to help keep it fresh. Ahead of its official reveal, our spies managed to snap some photos of a pre-production model finished in bright green, giving us a better idea of what the final model will look like. The answer is very similar to the current model. After all, Porsche doesn’t want to jeopardize a successful formula - last year, the Macan nearly doubled the Cayenne's sales, helping . There’s hardly any camouflage covering the Macan’s modesty, but, like other updated Porsches, the styling changes are very subtle. The front bumper has been redesigned with a wider lower opening, and the headlights and taillights have been restyled judging from the foil covering them up. At the back, the shape of the quad exhaust tips suggests we’re looking at a pre-production version of the range-topping Turbo model. The real changes, however, will be found under the hood. The four-cylinder engine powering the base model will deliver closer to 300 horsepower compared to the 252 horses the current model produces. There will be no diesel option, and the range-topping Turbo will get a new 2.9 liter V6 engine taken from the new Porsche Panamera replacing the current 3.6-liter unit. Do not despair, because power is expected to increase to 434 hp to match the outgoing Macan fitted with the optional Performance Pack. A fully electric version is also expected to join the lineup. 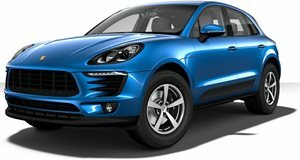 Whether these changes are enough to keep the Macan fresh remains to be seen, as the SUV is starting to show its age four years after being introduces. Keep in mind that it will still be based on the last-generation Audi Q5 - we’ll have to wait until 2021 for the all-new Macan to arrive with a new platform.